January 14, 2010: Paula spend most of the day getting ready for a trip that she has been planning for almost a year. January 15, 2010: Paula "Deep Diver" Persons and her SCUBA diver friend Rob Fitzsimons left with about 12 other divers from the Minnesota School of Diving. 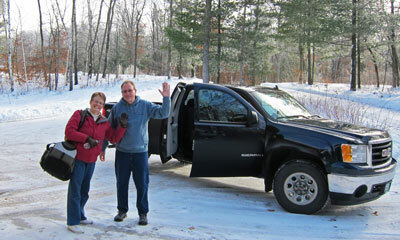 They headed for Cozumel, Mexico, for warm weather SCUBA diving. 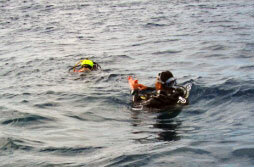 January 17, 2010: Bad weather, not able to dive this morning. Will try to get a shore dive this afternoon. Had a wonderful sampler dinner last night, shrimp, conch, sea bass, some other strange things. Large breakfast and then went to the town square to explore. Had a lime margarita for lunch. Walked to and from town total of about six miles. Have some nice blisters to prove it. Shopped a lot or looked, haven't purchased anything yet. Using only US money so far. The restaurant we ate at had a resident cat that visited us for a portion of the meal. January 18, 2010: Got two dives in in the morning and heading out now in front of the hotel for a very shallow dive. Seeing some nice fish, but this was the first day so no swim throughs or deep diving. Just shallow diving to work out the kinks. Eating some great food. Went to a nice restaurant last night and had chicken kabobs. Going to a real hole in the wall tonight. Getting local flavor but food is still supposed to be safe. Others are feeding the fish also known as losing their lunch but I have not had any problems at all. Going to bed early about 9:30 each night and sleeping well. Very slow pace also. 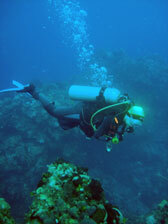 January 19, 2010: Three dive day. Had the night dive tonight. Much better diving. Some are getting sick in the group but I've had no trouble at all. Got to see a few lobsters, squid, octopus and lots of fish. Night dive tonight was really neat. My first ocean night dive. Saw a huge barracuda looked like it was more than six feet long. Having a really good time. Three dives leaving at 10:00 AM and returning sometime after 5:00 PM. Will then go out to dinner. January 20, 2010: Hi Love: Just arrived back from dinner. Got back from three dives today. Andrew loaned me his computer. Eighteen years old so he came back with us to talk with his girlfriend by computer. Got some very nice diving in. Great weather. Most of us have some red spots somewhere from sunburn. We all have blisters on our feet from being in dive boots and the sea salt. Seeing some cool eels and lots of lobsters, crabs. My camera battery lasts about a dive and a half before recharging. Figured out the fogging problem so was able to take photos today. Ate at the same place as Saturday night because the food was so good. About $20 a meal for Shrimp Barcelona. Excellent. Great weather, not many waves, sun with some clouds each day. Waves this morning about two foot. Didn't have the ripping current today like yesterday. Was tough diving for the newer divers. I am the last in the boat because my air consumption is good. Fun hanging out with the dive master watching the fish for our safety stops. I've changed boats each day. Well, two dives tomorrow and we are done. Will probably rent three jeeps on Friday and tour the island, Mayan ruins. 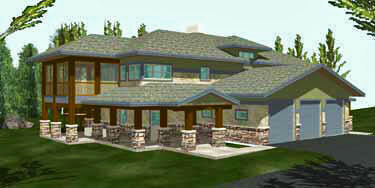 Will do it as a group heading to the other side of the island where it is very primitive. Only two roads on the island. Thanks to Karen Block for these photos of Paula. 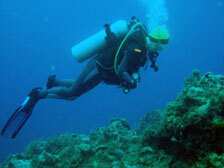 January 21, 2010: Had a nice day of diving. The sea has now claimed my sunglasses. Flew off the boat just as we entered the harbor. Tried snorkeling looking for them for an hour and had to give them to the sea. Had a very windy day and the wind caught them and took them right off my glasses. Saw some very nice fish today. Have taken nearly 400 pictures. 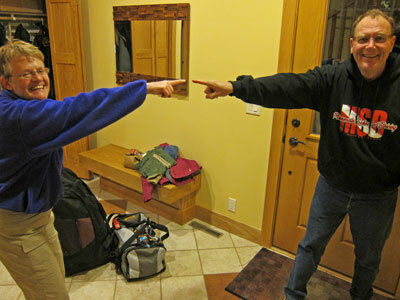 Editor's note: The "diving duo" returned at 11:15 PM after a long airline trip and very icy roads coming back to Brainerd. They were trying to decide who had the most fun on this diving adventure. Needless to say it will be remembered for a long time. Paula plans to put her photos in a story for this blog soon.